Located in perhaps the finest rain forest in the Southern Pacific Zone of Costa Rica, only 5 minutes from the commercial center of Uvita, and directly above the National Ballena Marine Park, which is home to the famous Whale's Tale, this is one of the last, large farms available in the Ballena / Uvita area. These properties, together, offer huge resources of old jungle growth and large usable areas. Natural springs provide abundant water, purest to be found anywhere. 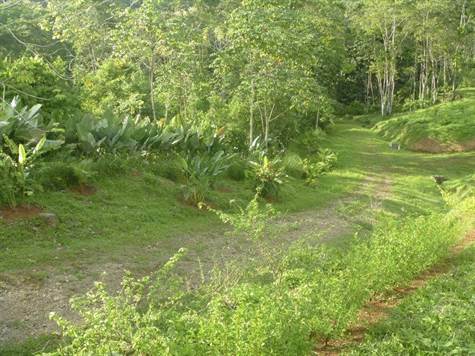 Bordered on the south by nationally protected forest and the north by the crystal, clean Ballena River, this beautiful and peaceful location with private rain forest surrounds many development sites with abundant wildlife. The properties comprise a total of 100 acres. There are approximately twelve (12) building areas for future development, some with ocean views, all with access to the spring water source that is legally concessioned. Access is very easy from the main highway and infrastructure within is ample to begin future planning. Annual festivities such as the Festival of Whales draw tremendous tourism to the area, along with the plethora of natural tours such as Waterfall rappelling, ATV tours, deep sea fishing, mangrove kayaking, world-class surfing, zip lining and much more. If you are seeking a farm to preserve for future years, this is it. If you are seeking development potential, this is also it. And if you are seeking a hotel concept, please call me for more information regarding an adjacent property with could be acquired separately thus adding to an incredible experience.